Heterotopic pregnancy is a rare type of multiple gestation consisting of an intrauterine and extrauterine pregnancy. Recently the increased utilization of assisted reproductive technologies have led to its increased incidence. A 26-year old patient treated for polycystic ovarian syndrome (PCOS) by clomiphene citrate conceived heterotopic pregnancy. The patient was admitted to our center with complaint of 6 week amenorhoea, lower abdominal pain, signs and symptoms suggestive of shock. A transvaginal ultrasound scan showed ruptured left tubal ectopic pregnancy with hemoperitoneum and an intrauterine heterotopic pregnancy. It was managed laparoscopically. Considering the literature showing the rising incidence of heterotopic pregnancy in the infertility treated patients as well as in the patients with history of pelvic inflammatory disease, tubal ectopic pregnancy or tubal surgery in the past, every sonologist and gynecologist must have a heterotopic vision because only an early diagnosis and timely treatment, will result in a favorable obstetric outcome without any maternal morbidity and mortality. Coexistence of intrauterine (IU) and extrauterine gestation i.e. heterotopic pregnancy, though a rare incident in spontaneous conceptions, has become common because of assisted reproductive technique (ART). The frequency in natural conceptions was estimated to be 1 in 30,000 pregnancies, found to be 1 in 100 pregnancies in ART conceptions. [2,3] Ruptured tubal ectopic pregnancy, as a gynecological emergency, requires urgent resuscitation along with surgical management. But in case of patients with heterotopic pregnancy as a result of ART, preserving the precious intrauterine pregnancy becomes very important part of management. 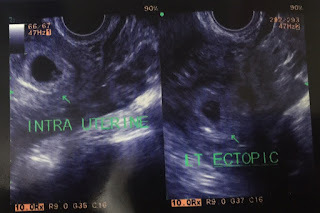 A case of heterotopic pregnancy is presented here which is rare but has become common due to increased use of ovulation induction drugs nowadays. A primigravida, 26-year old woman, married since 8 months was admitted to the emergency department with 6 weeks of amenorrhea, with acute abdominal pain, nausea, dyspnea and hypotension. She had conceived while she was on ovulation induction drugs in view of PCOS in a private hospital. Her ovulation induction was done with clomiphene citrate. There was no history of tubal ectopic pregnancy or tubal surgery or pelvic inflammatory disease in the past. Her past medical & surgical history was also insignificant. On general examination, she was conscious with intact orientation and response to all stimuli. Her BP was 90/60 mmHg, and pulse rate was 130 beat per minute. Abdominal examination was suggestive of an acute abdomen with severe tenderness. Her urine pregnancy card test was positive with serum β hCG levels 2100 mIU/ml. Laboratory tests showed Hb 8.2g/dl, WBC count 6700 /mm3, platelet count 2.6 lakh /mm3, her fasting and postprandial blood sugar, coagulation profile and liver and renal function test were within normal limits. The patient was admitted and initial resuscitation was done with IV fluids. After hemodynamic stability, transabdominal ultrasound was done which demonstrated moderate amount of free intraperitoneal fluid and a normal looking intrauterine gestation of 6 weeks 1 day with crown-rump length (CRL) of 4 mm, with presence of fetal heart activity. 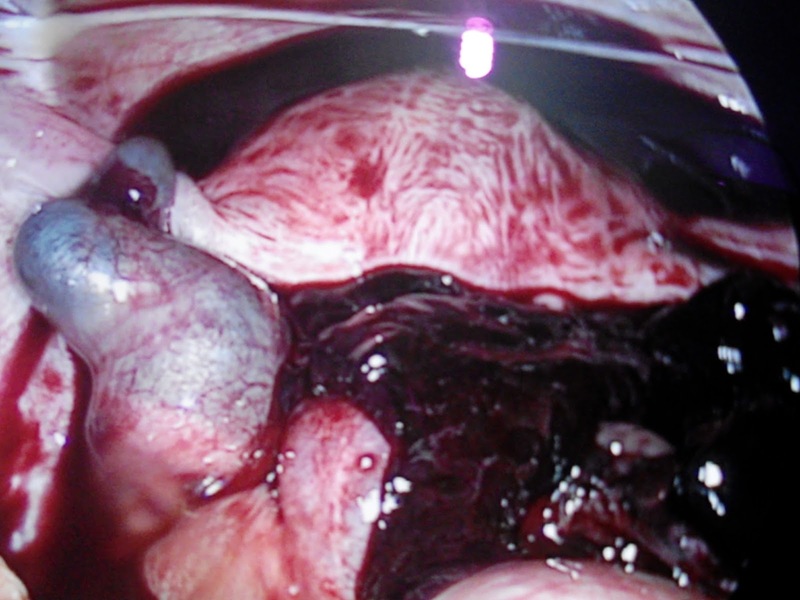 Left adnexa showed a gestational sac of 6 weeks suggestive of left tubal ectopic pregnancy. Both ovaries were seen normal. An emergency laparoscopy was performed under general anesthesia. Findings were suggestive of a ruptured left tubal ectopic pregnancy with about 1.5 L of blood in pouch of Douglas. Uterine size was about 6 weeks gestation. Both the ovaries appeared normal. A left sided salpingectomy was done with removal of the hemoperitoneum and irrigation and suction of peritoneal cavity. The patient was transfused with 2 units of blood perioperatively. The post-operative period was uneventful. On histology, the tube was found to have chorionic villi suggestive of ectopic pregnancy. An abdominal ultrasound scan was performed post-operatively and a single viable intrauterine pregnancy was seen. The patient was discharged from the hospital next day. The IU pregnancy proceeded without complications. Currently patient is continuing our antenatal checkups and has satisfactory ultrasound growth parameters. Figure 2 Laparoscopic view of the ruptured left tubal ectopic pregnancy with gravid uterus and moderate haemoperitoneum. Heterotopic pregnancy is a rare event as a natural conception, occurring in <1/30,000 pregnancies. With the use of ART, however, this incidence increases to about 1/100. Heterotopic pregnancies are usually diagnosed between 5 to 11 weeks of gestation. The initial diagnosis of heterotopic pregnancy is often difficult because of absence of clinical symptoms. Our case was diagnosed at 6 weeks, when the ectopic pregnancy was ruptured, presenting with hypovolemic shock and abdominal tenderness. Transvaginal sonography (TVS) helped in the early diagnosis of heterotopic pregnancy. However the detection rate of heterotopic pregnancy by transvaginal ultrasound can vary from 41 to 84%. Detection rate is increased if a high suspicion is kept in mind for high risk patients such as history of previous ectopic pregnancy, tubal surgery or previous pelvic inflammatory disease and those who had undergone infertility treatment. Also a high index of suspicion is important in the low risk patient presenting with abdominal pain and ultrasound findings consistent with intrauterine gestation sac and presence of free fluid in the pelvis with or without an adnexal mass. A heterotopic pregnancy is missed in the presence of IU pregnancy. The diagnostic role of serum β hCG levels in heterotopic pregnancy is controversial, because of its usual presence in normal intrauterine pregnancy. High levels of the serum β hCG (in our case 2100 mIU/ml) can lead us to look for coexisting extra uterine pregnancy before any acute manifestations occur. Laparoscopy has been found to be invaluable in both diagnosis and treatment. It is technically feasible and safe for removal of both ruptured and unruptured cases without disturbing the IU pregnancy. Laparoscopic approach prevents the postoperative inconvenience of laparotomy, as well as extra vigilant monitoring and patience required for medical therapy. Furthermore minimal uterine handling and drying from open exposure, prevents spontaneous abortion postoperatively. It is a definitive solution for the treatment of the ectopic pregnancy, being safe for the intrauterine gestation. To conclude, with high index of suspicion followed by early diagnosis and meticulous laparoscopic treatment of heterotopic pregnancy, there is a favorable outcome of intrauterine pregnancy without any increase in maternal morbidity and mortality. Govindarajan MJ and Rajan R.Heterotopic pregnancy in natural conception.J Hum Reprod Sci. 2008; 1(1): 37–38. Tal J, Haddad S, Gordon N, Timor-Tritsch I.Heterotopic pregnancy after ovulation induction and assisted reproductive technologies: a literature review from 1971 to 1993.Fertil Steril. 1996 Jul;66(1):1-12. Varras M, Akrivis C, Hadjopoulos G, Antoniou N. Heterotopic pregnancy in a natural conception cycle presenting with tubal rupture: a case report and review of the literature. Eur J Obstet Gynecol Reprod Biol. 2003; 106(1): 79–82. Jibodu OA, Darne FJ. Spontaneous heterotopic pregnancy presenting with tubal rupture. Hum Rep. 1997;12(5):1098–1099. Oyawoyea S, Chander B, Pavlovic B, Hunter J, Gandir AA. Heterotopic pregnancy: successful management with aspiration of cornual/interstitial gestational sac and installation of small dose of methotrexate. Fetal Diagn Ther. 2003;18:1–4. Lialios GA, Kallitsaris A, Kabisios T, Messinis IE.Ruptured heterotopic interstitial pregnancy: rare case of acute abdomen in a Jehovah's Witness patient.Fertil Steril. 2008;90(4):1200.e15-7. Louis-Sylvestre C, Morice P, Chapron C, Dubuisson JB.The role of laparoscopy in the diagnosis and management of heterotopic pregnancies.Hum Reprod. 1997;12(5):1100-2.